While everyone else is busy blowing up Illidan or chasing an Argus or whatever over in World of Warcraft‘s patch 7.3, Overwatch also put out a pretty massive patch today. The end of a competitive season always means balance changes, so they’re jumping right out of the gate with a ton of them before season six, which they also detailed in a developer video. For non-competitive players, Junkrat sees a ton of changes, most of which seem aimed at making him more viable, even for pros. His buddy Roadhog is also seeing a few changes which seem to be aimed at making him a more formidable tank. There are some changes to Orisa and Widowmaker as well. Widowmaker gets a highlight here too, with a new map. Her home, Chateau Guillard, is a lovely French estate. I’m sure she won’t mind if we blow it up just a little in the new Deathmatch game mode. You can access Deathmatch in the Arcade. Have fun storming the literal castle, kids! Two new game modes have been added to the Arcade: Deathmatch and Team Deathmatch! In Deathmatch, eight players go head-to-head until one player scores 20 points. Players will earn 1 point whenever they land the final blow on an opponent and will lose 1 point whenever they die to environmental damage (ex: falling off a cliff) or self-inflicted damage. This scoring will be tracked in a brand-new scoreboard. The first player to 20 points wins! In Team Deathmatch, two teams of four players face off until one team scores 30 points. Players will earn 1 point for their team whenever they land the final blow on an opponent and will lose 1 point for their team whenever they die to environmental damage (ex: falling off a cliff) or self-inflicted damage. If players are resurrected before they respawn, the corresponding point for their death will be deducted from the enemy team’s score. This scoring will be tracked in our default scoreboard. The first team to 30 points wins! We’ve made several modifications to many of these maps (including restricting play to a specific area and developing a special respawn system). We’re also introducing a brand new map specifically for Deathmatch: Château Guillard! Learn more about this map below. Both modes will be available for play in Custom Games. Watch our developer update for additional insight. Developer Comments: Over the past few months, we’ve been working on a number of significant under-the-hood changes that will help us streamline the patching process. This will allow us to reduce the download size in future patches, but it does mean that today’s patch is larger than a traditional patch. 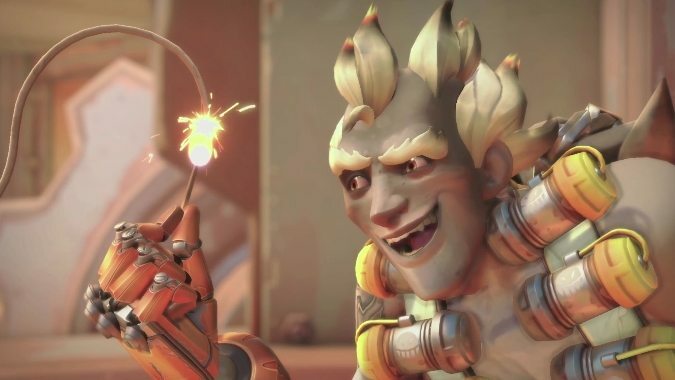 Developer Comments: Giving the Junkrat the ability to store two concussion mines adds some much-needed flexibility and versatility to his kit, particularly when using the mines for mobility. RIP-Tire’s damage has always been very good, but it was often difficult to steer the tire into position before it was destroyed. Increasing its speed will allow players to effectively detonate the tire more often and decrease the amount of time that Junkrat is vulnerable while controlling it. Developer Comments: The projectile speed increase helps Orisa’s consistency, especially at medium ranges (or further). Her barrier size has been increased to better protect her team, and the new shape makes the shield more effective when it’s used on slopes or on top of objects (such as a payload). Developer Comments: These changes help Roadhog be much more aggressive when looking for hook targets or blocking for his team. The combination of these effects significantly increases Roadhog’s sustainability and survivability. Developer Comments: Widowmaker is extremely powerful in the right hands, but her abilities often felt a little weak. The Grappling Hook cooldown reduction means she is more likely to have it available when she needs to escape. Venom Mine is intended to be an early warning system, uncovering enemies that are attempting to flank her or her team. With this change, she can see enemies when they trigger the mine, even if they’re on the other side of a wall. Developer Comments: Learn more about Skill Rating and Skill Tier Updates in our forum post here.